For the past couple of years Istria has been rightly proving itself not only to be the ‘Tuscany of Croatia’, but one of Europe’s most sought out tourist destinations. Its roads lead you through gently undulating landscapes scattered with small villages and hamlets, castles and the belfries of Roman churches. Today these sparsely populated old villages with their stone houses are mostly home to farmers, yet they still manage to offer everything they can sell to the curious tourists, from the excellent Teran and Malvasia wines to a wide selection of the local spirits infused with aromatic plants, as well as a great number of regional dishes with truffles and honey. Despite the fact that today there is the option to take a modern road that goes right across the so-called ‘Y’, it is so much better to take one’s time and choose the old road for a true adventure and the full enjoyment of the region. There are endless exits from the old road to overhanging and sometimes labyrinthine-like wine routes, from where you can explore the colourful interior all the way to the picturesque village of Bale. The name ‘Stancija’ or ‘Villa’ in Istria originates from the time when the Southern part of the peninsula was under Venetian Republic rule and the Northern part the Austro-Hungarian Empire. A Villa is a large estate of rectangular shape, which was rented to smaller farmers who grew crops and bred livestock for a certain aristocrat. These renovated villas are now a great opportunity for boutique tourism, of which Meneghetti is currently the most successful and it is also one of just three destinations of our southern neighbours that can pride itself on membership of the prestige chain of Relais & Châteaux hotels and restaurants. That alone is a guarantee of excellence, for both the accommodation element as well as the restaurant itself. And there is one more thing – this estate makes utterly great, if not the best, wine in Istria, and it also prides itself on traditionally good olive oil. After a few kilometres of offbeat, dusty roads you will find yourself in the middle of this paradise, which was overseen by the co-owners and masterminds of the project, Miroslav Plišo and Romana Kajfež. Miroslav is a partner in the famous Zagreb attorney office Marković and Plišo, whilst Romana is a biologist with her own medicine testing company and also the daughter of the man behind the creation of apavrine, Dr. Franjo Kajfež. 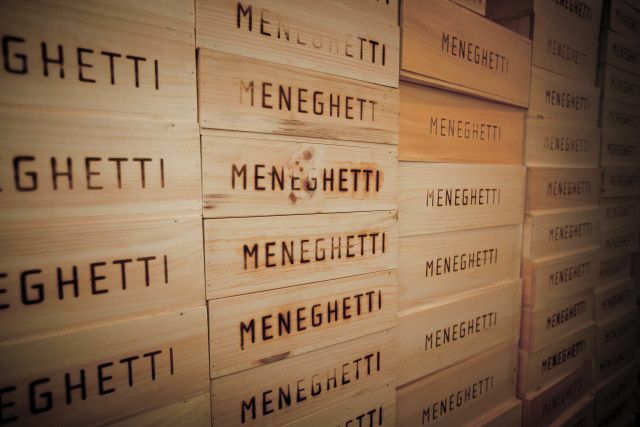 The 100 year-old Villa, which is set just two kilometres from the sea, took its Meneghetti name from the first owner, who moved to Bale from Udine. When the Austrians came to Istria in the middle of the 19th century, there was a fortress with 600 soldiers to protect Italy near Villa Meneghetti. However, in the 90s the estate started to decay until it was bought in 2001 by the Croatian attorney. The estate today spreads across 12 hectares of land planted with olive groves and a vineyard and enclosed by a stone wall. With some help from a famous architect, Riccardo Paliago from Rovinj, the new owners have managed to renovate the house and the garden and have been able to successfully merge the new with the old. The Villa has become something of a role model for investors who want to renovate a historical building but retain its authenticity and make it adapt to a modern way of living. The entire building is hewn from white Istrian rock and looks almost the same as in the 19th century. The only addition was an outdoor deck and some of the building had to be renewed to make space for an indoor pool. There are four luxuriously furnished bedrooms and bathrooms, a large living room with an open fireplace, a countryside style kitchen, a modern kitchen for the chef, a wine cellar, a pool and a sauna. A garden abundant with the aromatic Mediterranean herbs – one that also serves as the main restaurant area during the summer days – is rounded off with a covered terrace. The 400m2 Villa is full of vintage furniture from the 18th and 19th centuries as well as many smaller, authentic details, such as the vintage clocks on the fireplace or the garden table made from old doors of the house. There is an archery range, a golf course and an outdoor pool. Two of the biggest passions of the owner are wine and olive oil. There are 1,500 olive trees and 30,000 vines planted on the estate, from which they make olive oil and wine for themselves as well as to sell on the market. Miroslav was taught the art of wine making by the expert Slovenian vinter, Kristančič, and today they produce red wines from the merlot, cabernet sauvignon and cabernet franc varietals, and white wine from the chardonnay, pinot blanc and malvasia varietals. Their wine is then aged in oak barrels that have been imported from France. A stay at the estate means being treated with special care right from arrival. This care includes absolutely top-notch cuisine, the artwork of the culinary dream team of Danijela Pfifar and Bojan Vuković, who also previously cooked in the famous Valsabbion restaurant. The voyage of flavours begins with a degustation of two kinds of olive oil that awakens the appetite. The following menu is short but rich, and invites the guest to a sea or meat exploration of local delicacies. The simple, fresh ingredients are treated with creative touches in every dish. For morning fare, breakfast is referred to as “breakfasting” and understandably so – you could actually linger over breakfast for the whole morning. Even if they are only preparing breakfast for four guests, every guest is greeted with freshly baked bread, fresh fruit and homemade pastries. A truly special place in the estate is the table placed under the 100-year old oaks with views on to the surrounding vineyards. As an ensemble the estate feels like an island that has been dropped on the mainland, a place where time stops still and in an instant you are relaxed. Everything here is at an extremely high standard, but at the same time oozing genuine warmth. The space is perfect and is just calling out for small business gatherings or social events. The current plans for expansion are ambitious and as they include more capacity for business meetings make this calling even stronger. The property will certainly gain a lot from that, but at the same time may lose a little of the current charm of complete privacy and exclusiveness. In the meantime, get your skates on to feel some of the authentic Istria.